As part of D.C. Eats: Summer of Food, we’ve invited foodies and chefs from around the city to guest blog about their favorite food-focused work of art in The Phillips Collection. Amanda Phillips Manheim is an art lover and associate director of fundraising for FRESHFARM Markets. Read more posts in the Summer Menu series here. Marjorie Phillips, The Big Pear, 1955. Oil on canvas, 12 1/8 x 14 in. The Phillips Collection, Washington, D.C. I picked this painting from the collection because I spend a lot of my work day glancing at a photograph of a pear of our own–the graphic symbol of our most important fundraiser, the Farmland Feast. We picked our pear, a variety called Magness, for its job because it is one of our most local pears (born in Maryland) and a perfect subject for an event that takes place in the crisp fall. Harvest season. 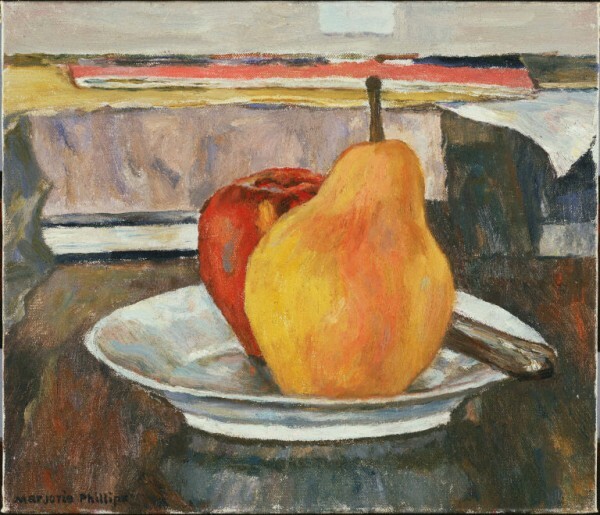 Marjorie Phillips’s pear looks similar–yellow with a tantalizing blush of reddish orange across its girth–but the Magness was only introduced after she painted The Big Pear. We must assume, then, that this is a different cousin, sitting coyly on its plate, tempting you to pick up the knife sitting by and choosing it instead of the red apple behind. The Big Pear is rather different from some of her other, more well known works, which tend to focus greatly on detail. Phillips celebrates this pear by its simplicity and that of its surroundings. We are drawn so quickly to it: the texture of the skin described by the brushstrokes, which seem to help contain the juicy, aromatic flesh within. The poor red apple is all but ignored. I wonder if, after the painting was finished, did she succumb to the pears seduction? This entry was posted in Experiment Station and tagged Freshfarm Markets, Marjorie Phillips, pears. Bookmark the permalink. I definitely would have succumbed! YES! A Marjorie Phillips painting!